We are taking our Warehouse Sample Sale on the road - we will be visiting our Cardiff, Manchester and Glasgow stores between the 10th & 17th September (see details below). All those who attend will be entered into a free prize draw to win two tickets to see Beady Eye in New York City on the 9th December with flights and accommodation all taken care of (T&Cs apply). Also if you spend over £150 at our Sample Sale event you will receive a £20 voucher to spend online (T&Cs apply). 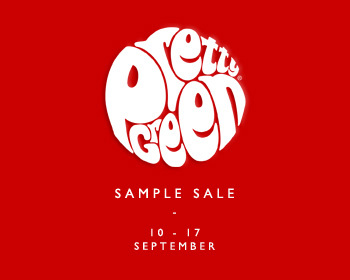 The sample sale will contain a selection of previous season products, this is a great opportunity to add to your Pretty Green collection or even find the hidden gem that got away! All Samples will be sold as seen, no refunds or exchanges will be offered. Head over to our Facebook page for full event details.